Downloading YouTube videos is among the first things you will look for once you get Ubuntu installed in your computer. Let me introduce you the easiest way to download(or save?) YouTube videos in your Ubuntu machine. First you need to buffer the entire video, that you want to download, in YouTube. That is wait until the entire video is loaded in YouTube. 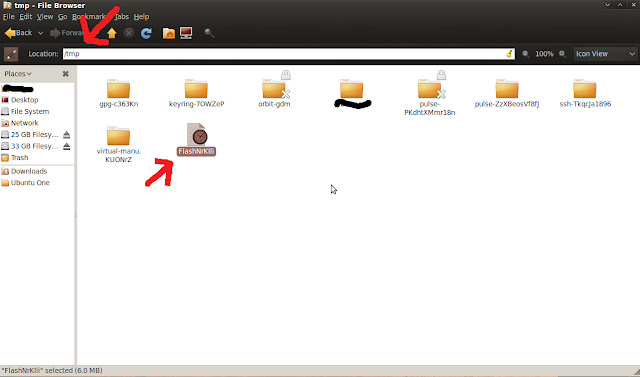 Now open nautilus(file browser) in Ubuntu and change the directory to /tmp/ instead of /home/username at the top of your file browser. If you still have doubts, look at the screenshot below. Look at the place where the two arrows point to. The above arrow shows where you can edit the path and the second arrow shows the YouTube video that you have just buffered. Now simply copy-paste the flash video to some other place from the location /tmp. Remember, you need to do this before you close the Web Browser, say Firefox for example, otherwise you won't find the flash video in /tmp. It is only stored there temporarily.